A California tribe reunites with long lost salmon relatives in New Zealand. 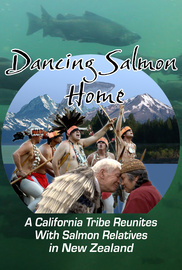 "Dancing Salmon Home" follows an emotional journey of loss and reunification as the Winnemem Wintu tribe of Northern California, crosses generations and oceans to reunite with long-lost salmon relatives. From their ancestral McCloud River, below Mt. Shasta, tribal members travel to New Zealand to meet the descendants of the McCloud River Chinook salmon, which have been missing from their home river for 65 years. Along the way, the 28 tribal members hold four days of ceremony beside New Zealand's Rakaia River, forging enduring bonds with the Maori people of the region, sharing a message of respect for the natural world, and launching plans to bring their salmon home. By Where Is My River?